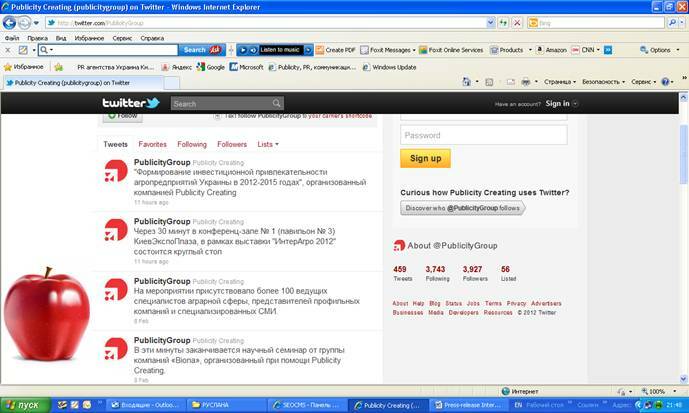 Online PR activities have become one of the main tendencies of the Ukrainian PR market in 2011. 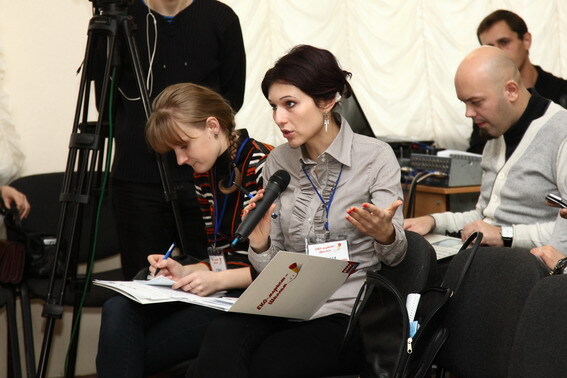 Online PR activities have become one of the main tendencies of the Ukrainian PR market in 2011. For instance, Publicity Creating Company has been increasing its online PR activity during the last year. As a result the number of online projects realized for clients have increased dramatically – such projects make 40% of all activities, carried out by the company last year. According to Publicity Creating such service as «maintaining official blogs of the companies» has been in great demand among the clients. In 2011 the specialists of Publicity Creating have been feeling the blogs of such companies as «ВIONA», sanatorium «Vernygora», «Poshtorg Ukraine», «Image Club» and others with urgent and actual information as well as increasing their concerned audience. Talking about the official blog of Publicity Creating it should be pointed out that it’s audience has increased up to 800 readers during this year and the actual information was added to the blog not less than two times a week. Herewith, besides the text content photo and video materials were used as well. Presenting companies, brands and other product lines in social networks and micro blogs (Facebook, Vkontakte, LinkedIn and Twitter) has become another popular online service in 2011 provided by Publicity Creating Company to its clients. This kind of service has been granted to many clients, such as «Jaffa Viva», ТМ «Iren Bukur», «Ukrainian postal service», sanatorium «Vernygora», supermarket retail chain «EКO-market», Group of companies «ВIONA» and others. The fact, that the platforms of Publicity Creating in social networks (Facebook, LinkedIn, Twitter) are updated regularly with latest news has been pointed out by independent experts - the company has taken the first place in «Social Media Activity Index 2011» meant to be the most active PR-agency in the sphere of social media. Aside from blogs and its platforms in social networks Publicity Creating has been increasing the presence state of its clients in online sphere using various video content (video news, experts points of views, commercials, TV plots). With this purpose on the most visited video websites there were created video channels of many companies such as «LEACOND», «EBM-PAPST Ukraine», TM «Iren Bukur» and others. By the end of 2011 video materials represented on Publicity Creating’s video channel exceeded the amount of 50. 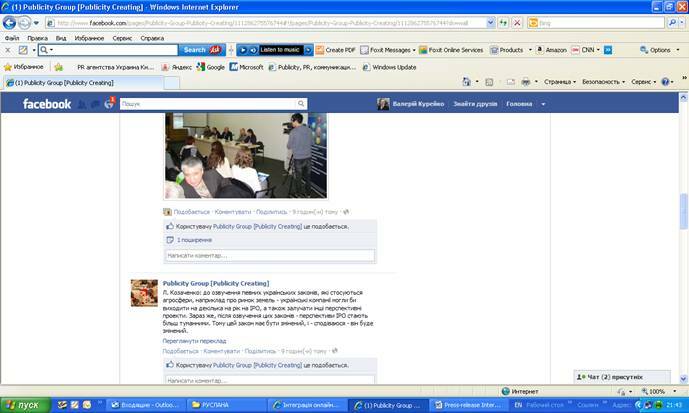 Concerning online events it should be pointed out that in 2011 Publicity Creating has organized a number of expert on-line conferences for its clients, for instance: «Lime Systems», «Poshtorg Ukraine», «Ukrainian postal service» and other companies. Moreover, the experts of Publicity Creating have carried out a lot off online broadcasting of offline events for their clients: press-conferences, roundtable discussions, meetings, lotteries within the framework of loyalty programs etc., which are also the part of online and offline PR integration. “It can be predicted that in 2012 the ratio of online and offline PR will even more change in favor of the first one. At the same time the forms of online and offline PR integration will become more complicated. Today Publicity Creating can offer its clients such kinds of services in order to broaden and enhance the promotional communication programs”, - pointed out Valery Kureiko, the CEO of Publicity Creating.